Tea lovers, did you read my post on Begu teas a while back? If you haven't read it, here is the link. Today, I have a wonderful giveaway in collaboration with Begu Tea for the readers of my blog. One lucky reader stands the chance to win Beguthree. 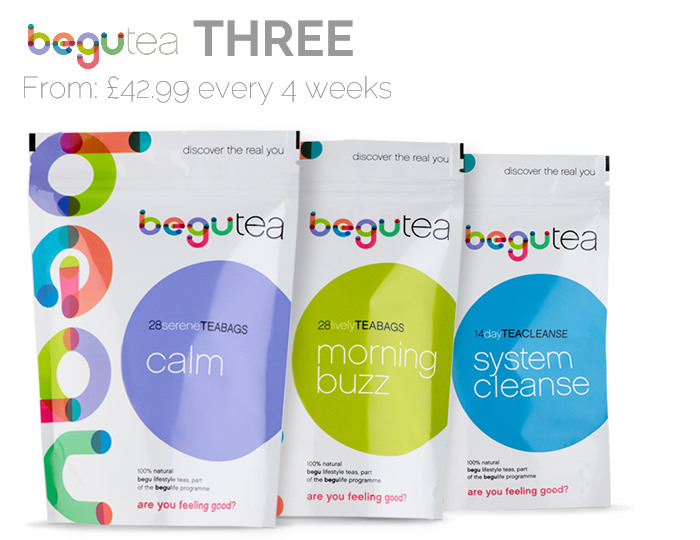 Beguthree allows you to choose three of Begu's six amazing teas, perfect for 4+ week weight loss plans. Each of the 6 teas has everything you need to know on the back of the pack including the ingredients list, how to use the teas and what each tea is for. Each tea has a different function based on the key ingredient of the tea. You can browse through Begu's website and choose your pick of three teas or the Begu team will be happy to assist you in picking the right blends. There is no subscription required for the winner. Your prize will be a one off pack of three teas including full personal nutrition and fitness services. Entry to the giveaway is simple, use the widget below to enter. All the best. Calm and night tea . Am always wired! Calm for my evenings to help me sleep and Morning Buzz as a gift for my mate, who's degfinitely not a morning person!! Calm ....I'm always worried about everything.